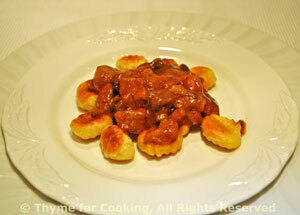 Gnocchi with Mushroom Sauce, Thyme for Cooking healthy gourmet cooking. Gnocchi, boiled first, then fried, gets a wonderful, crunchy exterior. Here they are finished with a savory mushroom sauce. Heat water in a medium pot for gnocchi. When boiling, add the gnocchi and cook just until they all float, 1 - 2 minutes. Drain. Heat 2 tsp oil in a medium nonstick skillet over medium-low heat. Add gnocchi and sauté until light brown, stirring and turning occasionally, 12 - 15 minutes. Trim and roughly chop mushrooms. Heat 2 tsp oil in a medium skillet. Add shallots and sauté until tender. Add Worcestershire, mushrooms, and sauté until mushrooms start to brown. Add tomato paste, beef stock, reduce heat and simmer 5 minutes. For a thicker sauce: dissolve cornstarch in water and stir into sauce. Arrange gnocchi on small plates. Spoon sauce over and serve.